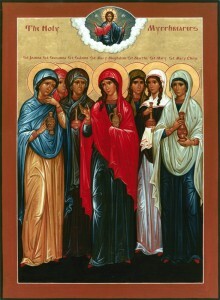 Saints Mary Magdalene, Joanna, Salome (daughter of Joseph), Mary (Joseph’s sister) the wife of Cleopas, Susanna, Mary and Martha (Lazarus’s sisters), were obedient to the observance of the Jewish Sabbath and waited until the following sunrise after the Sabbath to launch their plan into action. They were going to do something costly, something dangerous, something maybe even foolish in the eyes of others, but they knew in their hearts that it was the right thing to do. The Holy Myrrhbearers were poor peasant housewives with the exception of St. Joann a, who was the wife of Herod’s steward Chuza. Yet the Evangelist Mark tells us they purchased large amounts of expensive myrrh, ointments, and perfumes with which to anoint the body of our Lord. These humble servants sacrificed the little they had saved up for their own families for ‘a rainy day’ because they realized they could not put a value on God’s love. Christ’s presence in their lives had been priceless and they were not going to spare any expense to anoint the body of the One who loves without measure. The Holy Myrrhbearers literally put their lives at risk to accomplish their goal. Cities in the ancient world were walled for good reason – the territory outside the walls were an unsafe area and the domain of wild animals and thieves, especially after dark. Since our Savior’s tomb was in the garden near Golgotha, it was beyond the safety of the city walls. The women deliberately and knowingly stepped out into this vulnerability in order to express their love, in order to do what their heart commanded of them. Even more, assuming if they made it safely to the tomb, the Roman guards would certainly have used any force necessary to prevent them from entering the tomb. But the women were not paralyzed with the danger and risk, and they took action! There is a powerful lesson here for all of us. For all of us who profess our faith in Christ, do we also possess the fearless, trusting, unhesitating faith of the Holy Myrrhbearers? Too often, despite our initial good intentions, we allow ourselves to be discouraged from expressing or acting out our faith. We fear the COST of living as Christians, whether in actual financial terms, or in terms of the time and energy or emotion it takes to offer ourselves to others, out of love for Christ. We fear the DANGER of living as Christians – it always seems so much easier to maintain the status quo, and so much safer to keep doing the same old things the same old ways, even if it means passing up the opportunities to make Christ manifest in our little corner of the world. We fear looking FOOLISH by living as Christians, in a world of avoidance and compromise that holds values and priorities that too often are very different from the Gospel. Church, take your Orthodox fragrance out into the world and anoint the living Body of Christ!!! And Pray to God for us, Holy Myrrhbearers!